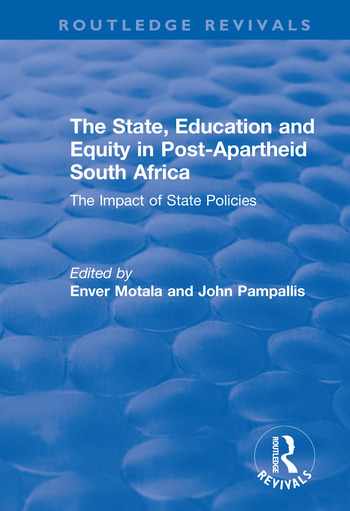 This title was first published in 2002: Has the South African post-apartheid state been able to achieve its stated goals? What has been the relationship between the process of educational reform and the impact on the state of the Constitution and other laws? This seminal book responds to these questions by examining the development and implementation of social policy in South Africa during the first years of democratic government, particularly in relation to education. The post-apartheid state was immediately faced with a broad spectrum of political, social, economic and human rights issues. The research analyzes whether the aims and objectives of the new administration were achieved; no other single collection of research in South Africa collectively explores the issues raised in this endeavour. The book will appeal to a wide range of professionals including researchers, academics, planners, policy makers, public servants and postgraduate students. Contents: Introduction, Enver Motala and Mala Singh; Educational law and policy in post-apartheid South Africa, Enver Motala and John Pampallis; The South African State in transition: a question of form, function and fragmentation, Sophie Oldfield; The link between macroeconomic policies, education policies and the education budget, Katerina Nicolaou; Transforming education and training in the post-apartheid period: revisiting the education, training and labour market axis, Nisaar Mahomed; A critical examination of the development of school governance policy and its implications for achieving equity, Jenni Karlsson, Gregory McPherson and John Pampallis; The rationalization of teachers and the quest for social justice in education in an age of fiscal austerity, Salim Vally and Console Tleane; On bureaucracy: South Africa in transition, Enver Motala; Bibliography. As a lawyer Enver Motala was involved in the defence of workers rights during the 1970s, a period of intense struggle for the recognition of trade unions in South Africa. From the 1980's he has acted in various capacities in the alternative education movement, especially in relation to issues relating to worker's and community-based education. John Pampallis has been the Director of the CEPD for the past four years. A former school teacher, he has taught in South Africa, Botswana, Canada and Tanzania. In Tanzania, he spent 8 years at the Solomon Mahlangu Freedom College, a school established by the African National Congress for young South Africans exiles.